On May 29, two days before Israel's botched raid of six "humanitarian" ships bound for Gaza, Robert Naiman, the policy director of something called "Just Foreign Policy," wrote an item on the Huffington Post headlined "Gaza Freedom Flotilla Shows Awesome Power of Nonviolent Resistance." He waxed lyrical about how the moral authority of nonviolence had compelled Turkish-controlled Cyprus to help the flotilla while Greek-controlled Cyprus had allegedly caved to Israeli pressure in refusing to help the heirs of Gandhi (it couldn't have been because the Turks were up to no good). Peaceful? A protest in southern Lebanon against the Israeli raid. "All this," Naiman gushed, "and the main confrontation between the Israeli occupation authorities and the Gaza Freedom Flotilla has not yet begun." Roughly 48 hours later, the "main confrontation" unfolded. In fairness, most "peace activists" on the ships were nonviolent, offering passive resistance. But on the last boat Israelis boarded, the supposed disciples of peace attacked the Israeli commandos. These new Gandhians beat the Israelis with metal bars and even threw one Israeli overboard. Funny, I'm no expert, but that's not how Gandhi behaved in the movie. Maybe there was a sequel with Chuck Norris as the Mahatma? Gandhi's back -- and this time, it's personal! The commandos had been equipped with paintball guns out of deference to the activists' professed pacifism. But when the goons attacked, out came the real sidearms. Nine "humanitarians" were killed. Now, one wouldn't expect Naiman to take Israel's side. He'd lose his social justice decoder ring for that. But one might expect him to at least lament the failure of his comrades to stick to their principled nonviolence. One might also expect kosher pigs to fly. After the incident, Naiman returned to the Huffington Post not to lament the outbreak of violence but to salute the resolve of the "humanitarians." He opened with a question: "How do you know when someone is serious about pursuing a strategy of nonviolent resistance until victory for justice is achieved?" Then he answered it: "When they refuse to turn back in the face of state violence. Damn the commandos. Full speed ahead." He then went on to celebrate another propaganda ship heading toward Gaza. How do you know when a proselytizer of nonviolence is full of it? When he doesn't object to the use of violence. Among Israel's friends, there's a deep and wide consensus that the "flotilla fiasco" was a public relations disaster, proof that Israel doesn't know how to work with the global media to shape world opinion. The first part is almost indisputable at this point. The raid was a disaster. As for the second part -- that Israel's problems are about public relations -- I'm not so sure. The assumption is that world opinion is open to hearing Israel's side of the story. But that hasn't been the case for years. From the "Jenin massacre" that was no massacre to the idiotic charges of "genocide" that erupt across the Arab world, the moment Israel defends itself from missiles or "martyrs," the presumption is always that Israel is the villain. When it turns out the facts support Israel, it's at best a footnote or proof the Israelis have manipulated the media. Question: If Israel is always hell-bent on murder, massacres and genocide, why is it so bad at it? If its battle plan called for a slaughter, why kill "only" nine people? Why not sink all of the boats? Meanwhile, is it really the case that Hamas is objectively "good" at public relations? Or Hezbollah? Or Iran? Really? I just don't see it. To me, these PR operations are less "Wag the Dog" and more Baghdad Bob (the Monty Pythonesque spokesman for Saddam Hussein's regime). But instead of laughing at the lies and idiocy, millions nod in agreement. North Korea recently sank a South Korean ship; the international reaction has been muted. 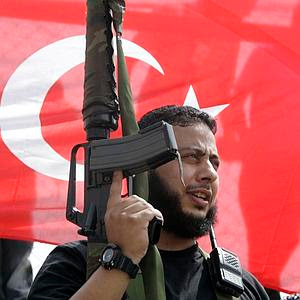 Turkey -- the Palestinians' new champion -- has been treating Kurdish nationalists harshly for generations; no one cares. The Russians crush Chechens, the Chinese trample Uighurs. Real genocides unfold regularly in Africa. Iran is pursuing a nuclear bomb. Hamas is openly dedicated to the destruction of Israel. So is Iran. But none of these facts matter. Indeed, it's tiring even to recount them in an environment where big lies matters more than obvious truths, where self-defense is "aggression," where restraint is "genocide," and where the heirs of Gandhi wield steel pipes.